How many new grad associate degree nurses have landed jobs recently? I was wondering how the job market is for us. I am going to graduate soon but I feel insecure about not having a BSN (which I plan to get within a couple years). I have a degree in a non-nursing related field but that won't count for much. It's hard to believe all associate degree nurses are just piling up with few getting jobs. 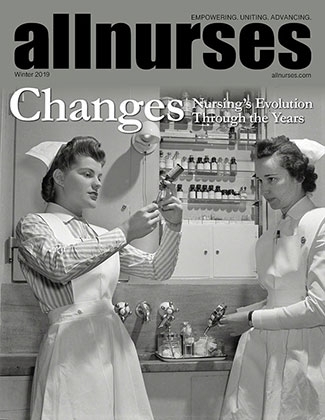 So are new associate degree nurses at all hireable? No interviews, so I want to call hirers to badger for interviews? I am going to graduate from an AAS program in May and I have been looking at jobs but see they all require experience and have no place for new grads. Once I start submitting resumes, I anticipate not getting many interviews, so I am thinking of calling nursing managers at hospitals directly to ask them for an appointment so that I could sort of use it as a job interview once I get there. Failing that, I plan to aggressively badger them until they at least give me a chance. I have talked to other nurses and they say the website openings are unreliable anyway so calling the nurse managers directly will give me a better picture. So I plan to call them and try to force an interview situation through a meeting and then get a job on that basis. I think this kind of confrontational attitude might be just what I need because few people are willing to say "no" face-to-face, because that's rude. I don't think it's unreasonable for me to expect to apply for a job in-person. I deserve at least that opportunity. Then, if they truly don't want me, they can reject -- IN PERSON. I refuse to be dismissed by letters in the mail and I refuse to be ignored. Can you guys weigh in on this? Med error in nursing school! I'm in my last semester of a nursing program and I made a med error today. It has me feeling completely guilty and it makes me seriously question whether or not I will be a safe nurse. What happened was I was assigned a new patient admit from the evening before. The patient had a prescription for synthroid on the MAR, for 0600 the following morning. But I assumed she hadn't gotten synthroid this morning either because she was admitted last night. So I went to my instructor and asked what to do even though there wasn't a dose scheduled. She asked someone the protocol and she told me to give the synthroid. So I gave it. Then I got a call informing me that a med error was made. The patient had gotten her synthroid that morning... and I just didn't bother to look at yesterday's handwritten MAR. I was told no harm was done and no one is going to get in trouble, but it makes me depressed all the same. How could I not think to look at the old MAR to see if she got her synthroid? The MAR is setup so that 0600 this morning doesn't show up on today's MAR. It shows up on yesterday's MAR as though it were a nighttime med. That's why I assumed she didn't get the synthroid yet. I am so angry at myself, especially as a last semester nursing student about to graduate. What are your thoughts on this?